Sujin shin-machi which means a new town in Sujin district is an amazing place for foodies. Besides a nice night market to taste local food, Sujin shin-machi is a symbolic place for a new wave in Kyoto city, the old capital of Japan. Now, let’s take a look back on a history of Sujin district. Japan had a social hierarchy system which is divided into 4 sections including Samurai(warriors), farmers, artisans, and tradesman. And, there is an estate which was placed under these 4 sections. Regret to say, there is discrimination for people in this section, and Sujin district was a living place for them. Before the Meiji era(1868–1912), the living place was fixed based on a social estate. Due to the discriminate image against those who live in the Sujin area, this area was considered untouchable for a long time, even after WW2. Owing to this historical background, the development of this area was not so easy, although it is just beside the Kyoto station, the biggest terminal station in Kyoto city. But, in 2015, the Kyoto City University of Arts decided to move to the Sujin area. The area of Sujin shin-mach is the exact area that will be a new campus of the Kyoto City University of Arts in 2023. Now, many people in Kyoto are interested in a change in this area. 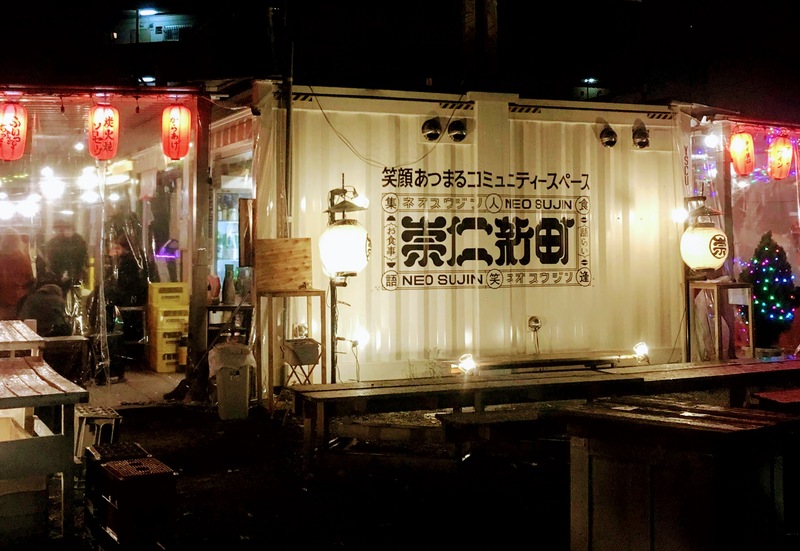 Before moving the university, students of the Kyoto City University of Arts, already participate in the management of Sujin shin-machi and they start to engage in this area, actively. For example, students design layouts of shops and organize some art events there. Sujin shin-machi has 16 different food stands including Japanese foods, for sure, American foods like hamburgers, other western foods and Asian foods like Thai cuisine, etc. Off course, you can enjoy various drinks, like craft beer, craft gin, and Sake(rice wine) made in Kyoto. Just beside Sujin shin-machi, there are 2 famous Ramen restaurants which always have a long queue.